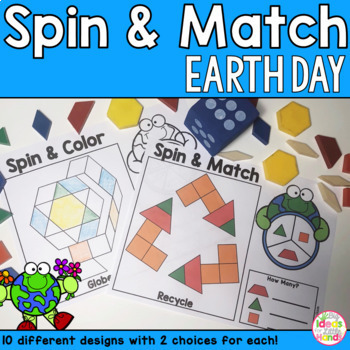 Are you looking for a fun Earth Day Geometry Pattern Block Math Center themed activity for small groups or to use in math centers? This is a fun game that your students can work on independently and even for early finishers! There are 10 different mats with 2 versions each to fit which version best meets your students needs. 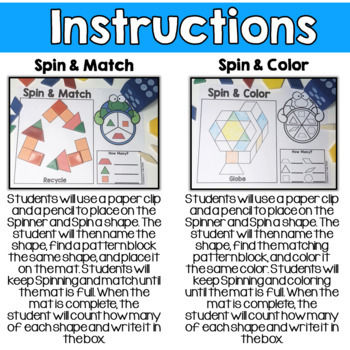 Spin & Match - Students will use a paper clip and a pencil to place on the spinner and spin a shape. The student will then name the shape, find a pattern block the same shape, and place it on the mat. Students will keep spinning and match until the mat is full. When the mat is complete, the student will count how many of each shape and write it in the box. 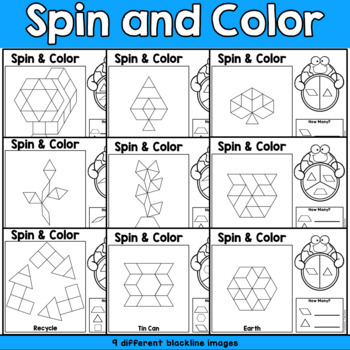 Spin & Color - Students will use a paper clip and a pencil to place on the spinner and spin a shape. The student will then name the shape, find the matching pattern block, and color it the same color. Students will keep spinning and coloring until the mat is full. When the mat is complete, the student will count how many of each shape and write it in the box. Students will love building these Earth Day themed pictures with their pattern blocks! 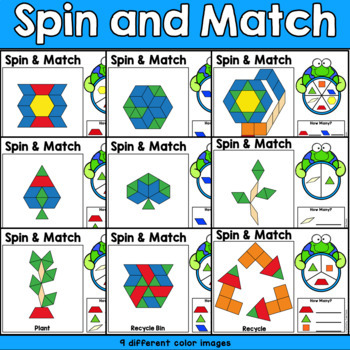 Check out my other Spin & Match games here! Check out my Roll & Match games here! Check out my Earth Day activities here! Thank you for purchasing, downloading, browsing, following and inspiring! I hope this brings your students excitement and makes your job a little easier! If you find anything in this packet that needs to be reworked or might work better for your students, please let me know and I will be happy to rework any activity/packet that you have purchased to fit your needs. I truly appreciate feedback. It helps me decide which products are most helpful and valuable for your students. The feedback you provide helps me make my products better to suit your needs. I Love to create so if there is anything that you might need or want to make your job easier, just let me know! Go to My Purchases page (you may need to login). Beside each purchase you'll see a Provide Feedback Link. Click it and you will be taken to a page where you can give a quick rating and leave a short comment about the product. Why is feedback so important? Each time you give feedback, you earn TPT credits that you can use to lower the cost of your future purchases. If you would like to be the first to know about my new discounts, freebies and product launches, click the GREEN STAR next to my shop logo on my main page and you will become a follower. This action will now send you email updates about this store. If you have any questions, be sure to contact me! All rights reserved by author. This product is to be used by the original purchaser only. Copying for more than one teacher or classroom, or for an entire department, school, or school system is prohibited. This product may not be distributed or displayed digitally for public view, uploaded to school or district websites, distributed via email, or submitted to file sharing sites. Failure to comply is a copyright infringement and a violation of the Digital Millennium Copyright Act (DMCA). Intended for single classroom and personal use only.